Two great ways to validate a strong herdsire are longevity in the show ring and the ability to pass those traits to his progeny. Skyfall has conquered both. SpringToo Skyfall has over a dozen cria on the ground with impressive results. We have been very pleased with his ability to improve the characteristics of the dam, even when bred to powerhouse females. As an added bonus, Skyfall frequently pulls color! We have been surprised a few times by seeing dark and fawn noses emerging from a white/light female. 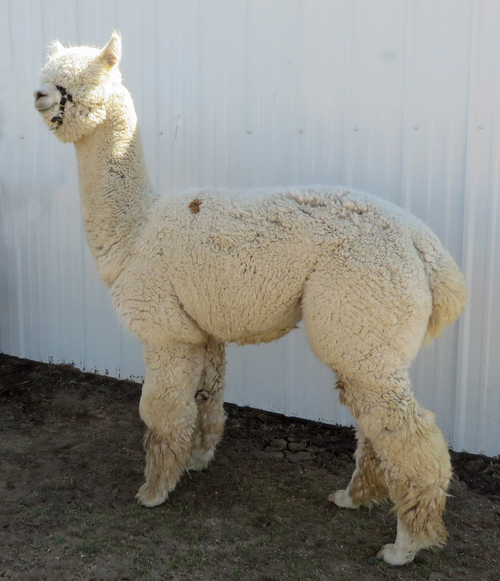 The majority of his offspring inherit his gorgeous head, muscular frame, and highly evolved fleece structure. One of his offspring, Xanadu Anthem, just received the white halter Color Championship and Judges Choice award at the 2018 Fall Festival! To date, Skyfall has been awarded three Color Championships, a RCC, two Spirit of the Industry awards, Best Hand, two Judges Choice awards, Best Crimp, Best Brightness and a handful of blues. 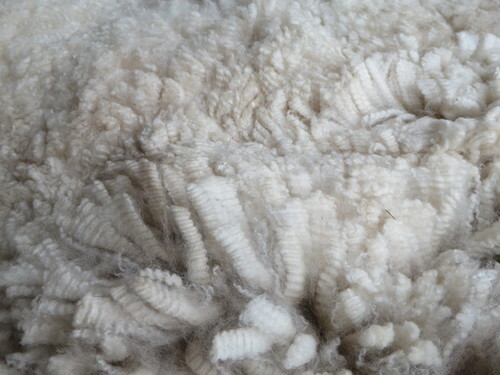 The Judge's comments on his fleece were " Excellent fleece in all qualities. Healthy and well organized. Dense and Fine. WOW!". He scored a very impressive 88.5 out of 100! 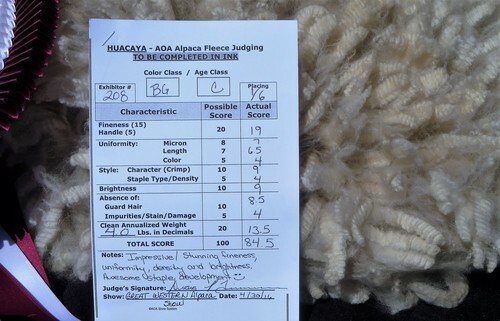 In the 2016 Fall Festival Alpaca Show, Judge, Sharon Loner, stated she used his fleece as the benchmark for brightness for all other fleeces. 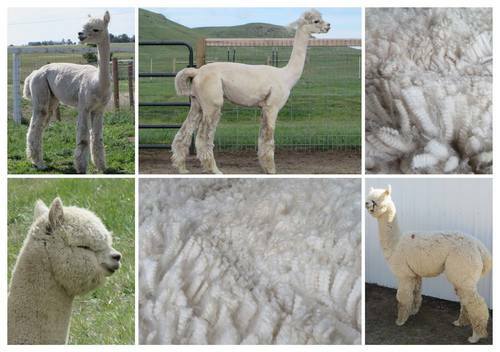 Skyfall's fleece is spectacular. It displays highly organized staples and beautiful bundling. His fleece is bright beige that feels like pure heaven. With incredible density and long staple, he provided over a 5 lbs blanket for each of the past 3 years. Skyfall has a typey head, large frame and heavy bone which creates a dashing and elegant male. As a bonus, he has a sweet temperament and is easy to handle. He also likes to steal an occasional kiss! Skyfall has color champions on both sides of his pedigree. 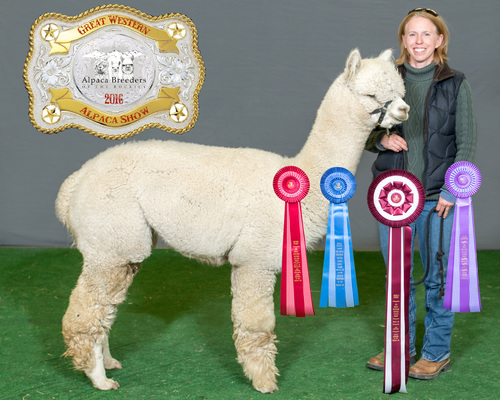 His sire is Flying Dutchman Alpaca's Rembrandt by El Nino and his dam is SpringToo Spellbound. 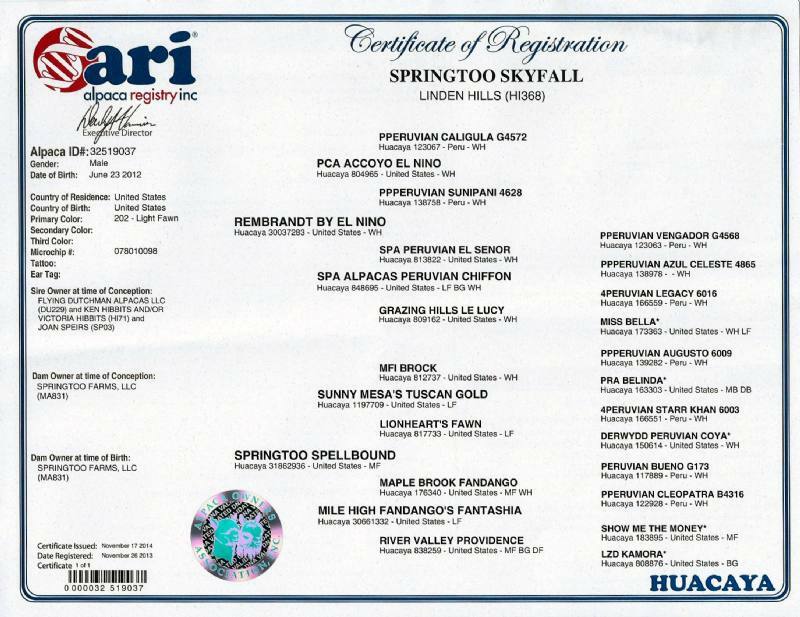 Spellbound is a multiple color champion who also comes from a noteworthy lineage: Sunny Mesa's Tuscan Gold and Mile High's Fandago's Fantasia. El Nino is legendary in the quality of offspring and championships. Skyfall is a powerhouse of genetics and we are thrilled to have him as a part of our herd. 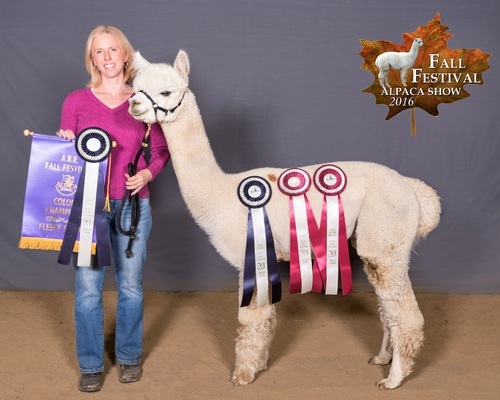 We are very excited to offer this male for stud services to help enhance alpaca qualities around the country. Please do not hesitate to ask if you have any questions, would like to request a fleece sample or schedule a farm visit. Discounts are available for multiple breedings to Skyfall or combined with breedings to Valor. Thank you for considering Skyfall! We accept cash, checks and credit cards for breeding fees. Credit cards will be charged an additional 2.8% to compensate for processing fees.